October 1, 2014. 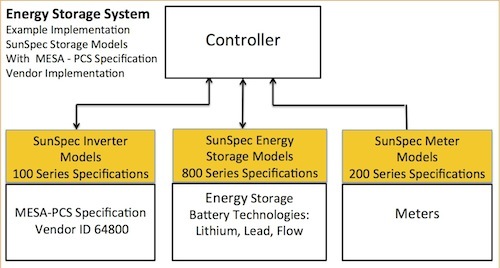 The SunSpec Alliance Energy Storage Workgroup, in conjunction with the MESA Standards Alliance, is pleased to announce the fruit of its first work product: the SunSpec Energy Storage (ES) Specification, now available for download with other supporting SunSpec specifications at www.SunSpec.org. Click here to learn more. In January 2014, the SunSpec Alliance announced the formation of a new workgroup with the MESA Standards Alliance to develop and promote communication standards for batteries and other energy storage technologies used in grid-connected energy storage systems. The SunSpec Energy Storage Workgroup worked over the last nine months to develop models to support a variety of energy storage applications from large, multi-megawatt-hour systems deployed at utility substations, to islanded microgrid installations and smaller systems connected on the customer side of the meter. SunSpec members in the workgroup included 1Energy, Advanced Energy, SMA, Outback Power, Ideal Power Converters, and Loggerware, with inputs from the MESA Standards Alliance and other SunSpec Alliance members. The charter of the SunSpec Energy Storage Workgroup is to develop and promote communication standards for batteries and other energy storage technologies used in grid-connected energy storage systems. The SunSpec ES Specification standards work is the starting point for storage control and communications standards. Click here to learn more or go to sunspec.org/specifications to download.